The main objective of the visit is to get applied knowledge on rice farming from the experts at RRDI. 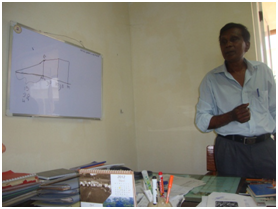 Mr. Gunadasa explained on the rice phenology and durations for the each stage in the rice cultivation. However, he mentioned that RRDI does not own phonological data for the cultivars released from the RRDI. These data available with the breeder or the researcher existed on past. He also mentioned the same statement gave by Mr. Gunadasa. This entry was posted in Internal visits, Uncategorized. Bookmark the permalink.